With the rapid development of gene editing technology, especially the extensive application of CRISPR technology in recent years, humans have gained the unprecedented ability to change and modify the genome. CRISPR technology is derived from the bacteria’s own “immune system” against bacteriophage. This technology utilizes single-stranded guide RNA (sgRNA) and the Cas9 protein to enable simple, rapid, and low-cost gene editing in vivo and in vitro. Using CRISPR technology, people can not only effectively edit the coding gene and perform the large-scale genome screening, but also can combine with Next Generation Sequencing (NGS) to study the function of non-coding RNA (ncRNA). 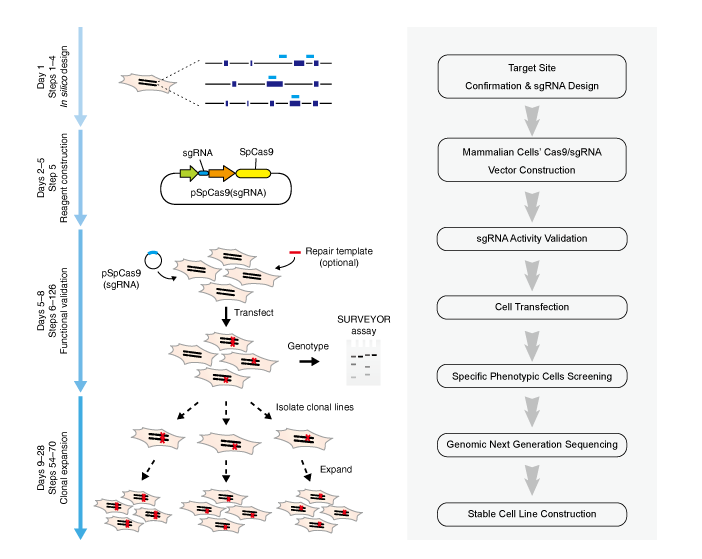 Nowadays, CRISPR technology has been widely used in various laboratories around the world. Researchers are able to achieve the artificial gene modification on almost all cell lines and most commonly used experimental animals. Meanwhile, CRISPR gene editing technology has broad prospects and great potential for development in the study of human genetic diseases, viral infection diseases and cancer research.